Tenya team party of ten GIVEAWAY! And speaking of happy, I'm currently holding a Tenya giveaway on my Instagram! If any of you are interested, please join! Who knows, you might just be that lucky winner of Tenya's Team Party for Ten! ^_^ Yey! I love their food! Check out the mechanics below! But this is for Instagram! Are you currently craving for the best tempura in town and maybe a little soba on the side? I know I am!😊🍤🍜 But of course, I'm not teasing you guys for nothing! 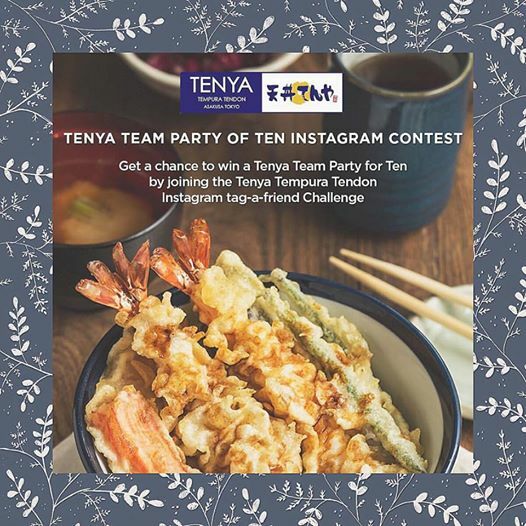 Get a chance to win a Tenya Team Party of Ten by joining the Tenya Tempura Tendon Instagram tag-a-friend Challenge!😊👉🏼👫💙 Just follow the easy mechanics below! 3.) Regram the photo above and tag nine friends to create a party of 10.